These pages and links are designed to be used by students who are studying Philosophy & Ethics at A level. The exam board which is being followed is Edexcel. The link below will take students to the Edexcel website where you can down load specifications and past exam papers if you do not already have access to them. 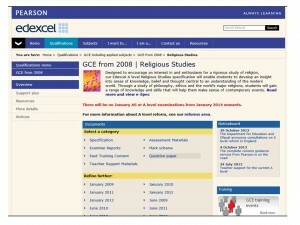 Just click on the Edexcel site below. Teachers resources can be found within the ‘teachers’ section of the website though you will have to contact us to get a login.